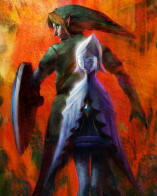 Do you think Zelda Wii and the Legend of Zelda series in general needs to take a shift in the mature direction? The folks over at Gaming Gauge think not and actually prefer the roots of what the Zelda series is all about. In a very short article, the author points out the darkness of Majora’s Mask and how Twilight Princess seemed to be a shift for the series in a darker direction. However, the author then points how the maturity of the series is somewhat taking away from its roots. However what we can’t forget is the roots of The Legend of Zelda. The series, when brought down to its base elements, is a fairy tale. It’s about a young boy who goes on an adventure and saves a princess from an evil tyrant and it is that sense of wonder, adventure and naivety that is key to the experience. According to Shigeru Miyamoto himself the series is based on his experiences as a child exploring the woods and it is fundamentally this perspective of a child that we perceive the franchise through. Personally, maturity in video games is not exactly relevant for me. Games in general have taken quite a turn towards the more violent and realistic approach. Game sales will show that on other non-Nintendo consoles, games such as Call of Duty Modern Warfare 2 are what the fans are crazing. I’ve never really felt that making a game darker or more mature is what is needed to make a great game. I suppose dark elements are good for character building and making villains seem legitimately scary, but I don’t think that they need to go over the top with it. I’m perfectly fine with the Cartoon world of video games as it is now and while I’d like a refresher with the storyline, I hardly think a more mature feel is exactly what is needed. Be sure to head on over to Gaming Gauge to check out the full article and then let us know what you think by posting in the comments below!